From left: Shelley Zimmerman, Sarah Jarvis, Carly Smith, Mike Fleming, Morgan Hornibrook, Trish Meng, Hannah Meneley, Scott Bateman, Rick Wightman, Paul Cook and Wei Song. In this technology-driven world, there’s almost no limit to what can be achieved or how computer science can be applied to our everyday lives. This opportunity for advancement, innovation and creativity is what the faculty of computer Science at UNB’s Fredericton campus shared with middle school students, who are still exploring and developing their own unique tastes and interests. 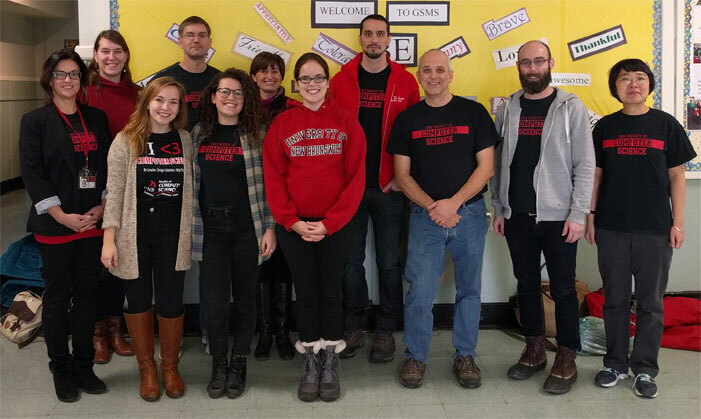 Faculty, staff and students were invited to George Street Middle School where they ran interactive workshops, helping to expand the grade 8 students’ understanding of the capabilities of technology and its practical uses today. Students were introduced to the fundamentals of computer science through a series of activities. Practical application and discussion helped them to connect not only how technology is used in their everyday lives, but the innovative ways in which it’s being used in industries like agriculture, film and music. A female senior undergraduate student was paired up with each team, leading activities and acting as role models for young girls with an interest in technology. According to a study by Statistics Canada, science, technology, engineering and mathematics (STEM) still remain male-dominated fields in academia and the workplace. The faculty of computer science wants to empower and encourage children of all genders to pursue their interest in technology. “We’re very encouraged by the response we received from this. It’s gratifying to see the interest among young people and to be able to have such a positive impact on the community,” says Dr. Ali Ghorbani, dean of the faculty.